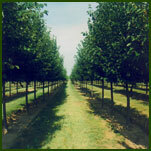 Shade & Ornamental Trees are available from our 25 acre nursery. Grown in their native soil. Welcome to Huggett Sod Farm, Inc.
Huggett Sod Farm, Inc. is a family owned business that has served the diverse needs of homeowners, landscapers, lawn care professionals, golf course superintendents, and sports field managers for over 60 years. We have a commitment to provide you with quality products, along with the experience & knowledge to help you with any green industry project. 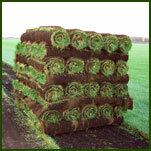 While most of the sod is grown on peat, we also grow on mineral soil. 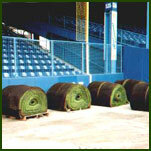 Varieties of turfgrass include: bluegrass blend, turf type/tall fescue and fine fescue/bluegrass mix. We utilize the results of studies done by the National Turfgrass Evaluation Program based on the overall performance of the varieties for our region. Since 1993, Mark Huggett has managed Huggett Sod Farm, Inc., by employing state of the art harvesters that have been customized for our cutting needs along with wells and man made ponds to supply water for our modern irrigating systems which include: wheel lines, center pivots and irrigation guns. Huggett Sod Farm, Inc. has distribution facilities in Michigan and Ohio with our own fleet of trucks for delivery (fork lift unloading provided) to Michigan, Ohio, and Indiana. Customers may also pick up at our farm in Marlette, Michigan. Over the past 60 years, Huggett Sod Farm, Inc. has been fortunate to have quality employees with varying talents who are focused on providing our customers with the best service and quality of sod anywhere. 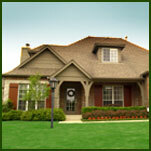 From the office manager and drivers to the sod crew, many of our key people have more than 30 years experience. Let us put our experience & knowledge to work by showing you our commitment to providing you with quality tree and turf grass products!